Fusion of geological treatise and adventure yarn, exploring the mysteries of Central American jade. During his research about explorer Alexander von Humboldt, Helferich (Humboldt’s Cosmos, 2005, etc.) learned about jade’s importance to pre-Columbian societies: “To peoples such as the Maya, jade was not only heartbreakingly beautiful but supremely powerful.” Over time, archaeological expeditions revealed a trail of discoveries that proved the Mesoamericans used jade to create objects for every purpose, and even considered it to have mystical powers. Yet the sources of the mineral remained lost. Through much of the 20th century, adventurers like Edward Thompson, who recovered more than 5,000 jades from a sacred Mayan well in 1909, added to the historical record while shamelessly shipping their finds off to sponsors and museums like the Peabody, without solving this fundamental mystery. In the early 1970s, an American speculator named Jay Ridinger impulsively relocated to San Miguel, Mexico, and became intrigued by the idea of searching for jade. Ridinger would be credited with the revival of the Central American jade industry, although for years it appeared a fool’s errand, especially considering that only certain types of Asian jade were then considered valuable. (Helferich notes that in both Olmec and Chinese cultures, jade “was considered nothing less than virtue incarnate.”) In Guatemala, Ridinger and his prospecting partner (who eventually became his wife, and continues to run their business) were regarded as “idiotas, outlandish but harmless”—until they found a jade deposit near the Motagua River and purchased the surrounding acreage. Despite numerous setbacks, including the threat of civil war, the Ridingers eventually established a business, creating new carvings that represented jade’s “deep history and its ties to the great civilizations of the past.” Helferich delivers a lively narrative, notwithstanding passages focused on the scientific minutiae underlying the Ridingers’ improbable success. 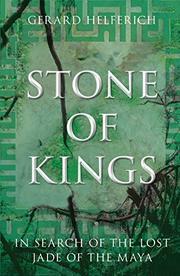 Engaging cross-cultural tale of ancient peoples and modern desires.